Enquiries are always welcome from qualified students or postdoctoral scientists with scholarships or fellowships to support their research. Our research is in the area of catalysis, with a particular focus on catalytic activation of small molecules such as H2, N2 or CO2. Much of our work involves studying fundamental mechanisms of catalysis, at metal centres in enzymes, and at metal nanoparticle surfaces relevant to fuel cell electrodes. We are also developing applications of immobilised enzyme cascades as heterogeneous catalysts in industrial biotechnology for chemical synthesis. One key focus is in bio-inorganic chemistry: we use electrochemistry to control redox states of metal-containing enzymes and simultaneously use infrared spectroscopy to follow the binding of ligands to the metal centres. We are interested in enzymes that act as redox catalysts for the activation of H2, CO2, CO and N2. These enzymes utilise active sites built from common metals such as iron and nickel or molybdenum and their chemistry is relevant to future energy technologies. There is much that we can learn from how nature tackles this chemistry, and the spectroscopic tools we have developed are providing new insight into how these enzymes function. 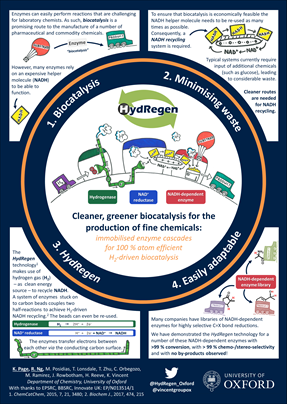 The group is particularly interested in bacteria that live on H2 as an energy source - as chemists, we can take inspiration from efficient and selective catalysis of H2 oxidation and production at nickel-iron or iron-iron centres of hydrogenase enzymes. 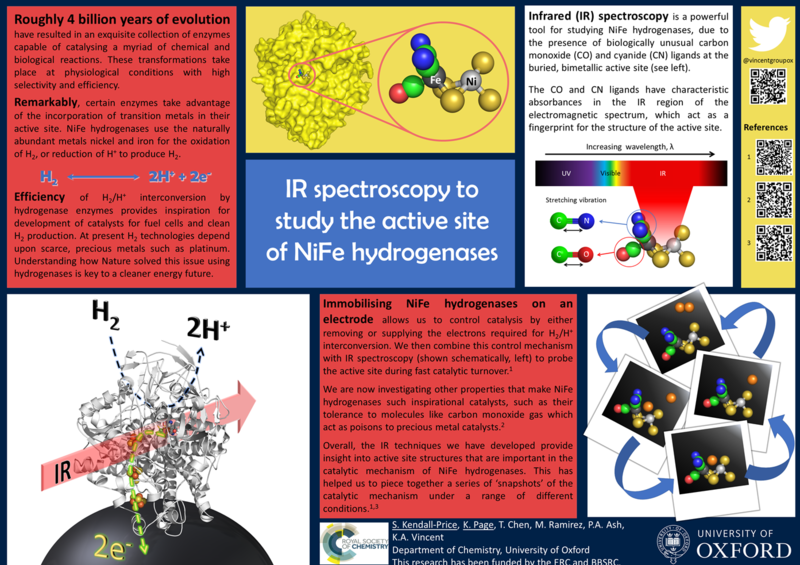 In collaboration with molecular biology experts, we are probing the chemistry and mechanism of hydrogenases using our new approaches to IR spectroelectrochemistry. Much of our research requires development of specialised methods and equipment. The Vincent group is also using IR spectoelectrochemistry to probe the surface chemistry and reactions of supported metal nanoparticle catalysts relevant to fuel cell chemistry. Our techniques allow us to look at intermediates in catalysis and catalyst poisoning steps while we maintain an efficient flow of fuel such as formic acid or ethanol. The group also has interests in applications of enzyme catalysis for chemical synthesis. We have developed a novel approach to H2-driven recycling of the biological cofactors NADH and NADPH using enzyme-modified graphite beads.